If your family is visiting the Grand Canyon, you’ll find plenty of lodging options, from campgrounds to modest lodges and hotels. 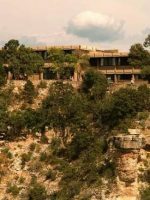 Located directly on the South Rim of the Grand Canyon, El Tovar is a great option for those wanting to get right up close and don’t mind staying in a somewhat remote setting. With the look and feel of an old-fashioned hunting lodge, families will love the rustic charm as much as the stunning views. 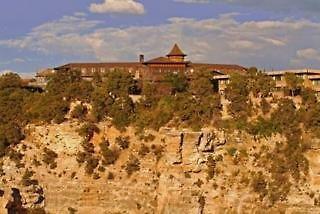 The hotel’s biggest asset is its location: Several of El Tovar’s rooms have direct canyon views. The hotel has 78 rooms and suites, all with standard but not fancy amenities. Standard rooms have one double, one queen, or two queen beds. Deluxe rooms have either two queens or one king bed. Suites have a bedroom with either two queens or one king bed, and a sitting room. Because it is an historic building, rooms are on the small side, and there is no elevator so you will need to carry your bags up to your room. Leave the strollers in the car. 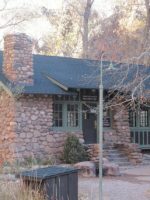 Still, El Tovar offers all the basics, which you'll find some lodging options within the Grand Canyon National Park do not. You'll have cable television, a phone, refrigerator, full bath and air conditioning. Suites have a sitting room, some of them have a porch or balcony. Rollaways are available. The hotel was recently renovated (2005) but remains rustic (don't come expecting 5-star amenities), with a southwestern style. 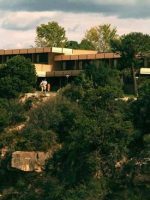 El Tovar is a favorite for many canyon visitors and rooms, particularly the suites, fill up very quickly, so book well in advance, if possible up to a year ahead. Lie - Lie - Lie .... made our stay far less than what it should have been - so wrong! My reservation was made months in advance. We arrived 5 min before check-in time at which time I inquired if there were any rooms with a nice view. I was explicitly told that there were 4 suites in the hotel that had any view. We were then given our room on the basement level, seriously, one cannot make this stuff up. The view was that of a planting bed where we were able to see the legs of tourists walking on a path around the building. The next morning, the same lady was there for checkout. I asked once again, "do you mean to tell me that in this entire hotel, surrounded by windows, that there are only 4 rooms with windows?". The reply was now that all of the rooms have windows and 4 have Canyon Views. She achieved her desired result and pawned off a horrible room to us. A member of the front desk staff lied to a guest. This is not an acceptable practice. Remember, we arrived 5 min. before checkin and would have waited until a respectable room was available. IF ANYONE HAS A SIMILAR EXPERIENCE, PLEASE SHARE IT SO THAT THIS PRACTICE COMES TO AN END. Otherwise, the quality and cleanliness of the room was acceptable for the price point. Their WiFi was substandard and almost unusable. Perhaps, even worse for us guests sequestered to the basement. The lunch room service menu had been updated on their web site but not the dinner menu. The quality of the food was pretty good and the prices were acceptable. The sauce on the Chicken Florentine was very thick. This item came with Angel-hair pasta but, due to the thicknesses, it could not be mixed into the pasta. They need a bit more sensitivity with the preparation of foods in high altitudes. Overall, this property is a destination property where return patronage is not common. I cannot recommend it to friends if they will be lied to or potentially be placed in the basement. 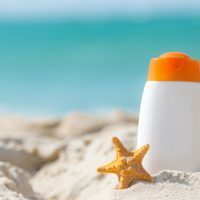 Our stay was essentially ruined because of this really bad business practice. Let's see if the General Manager has the ability to reply and comment on the front desk practices. Besides the historical aspect very disappointed in food and parking. The food is way overpriced for quality and no separate parking lots upon check in. My husband drove around for thirty minutes looking while I was promised a bell man after check in to help with the luggage while sitting on the porch. The bell man never showed up and my husband had to park down the hill by the bright angel. Had a much better experience at the Yavapai. 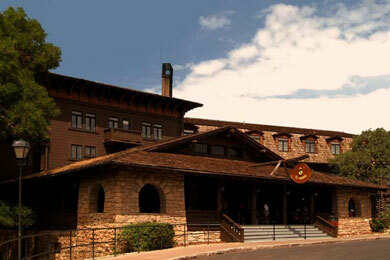 El Tovar is located inside Grand Canyon National Park, so there is plenty to do and even more to see. It's not one of the seven wonders for nothing; the landscape here is breathtaking. And while the hotel does not offer anything in the way of children's programs or babysitting, chances are, you came to share this magnificent park with the kids. El Tovar will provide information on all kinds of activities, including hiking, biking, mule rides, tours and sightseeing trips, all of which are right nearby. If you are looking for a program specifically geared toward children, try the Junior Ranger program. It is open to kids ages 4-14 and run by the by National Park Service Rangers. The program teaches kids all about the area, how the canyon was formed, and how to help protect it. In addition, the Grand Canyon Field Institute offers day classes for kids 8 years old and older (accompanied by a parent) right within Grand Canyon National Park. 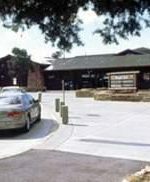 In addition to canyon activities, there are several museums and cultural attractions in and around the area. The Desert View Watchtower is a fun place to take the kids. Modeled after the ancient Pueblo watchtowers, the 70-ft. tower offers amazing views of the South Rim. The walls are painted with murals by Hopi artist Frank Kabotie. The Watchtower is located at the eastern end of the Grand Canyon South Rim, approximately 26 miles from Grand Canyon Village. The Hopi House was the first curio shop in the Grand Canyon, and is a great place to shop for souvenirs. They sell native arts and crafts, jewelry, and authentic Pueblo pottery. El Tovar has one dining room, which seats about 200 people and serves three meals a day, including a large breakfast and free morning coffee. A favorite with visitors, its large windows and historic feel (the hotel was built in 1905) make for a cozy atmosphere. The dining room sits perpendicular to the rim, so some tables offer a canyon view. 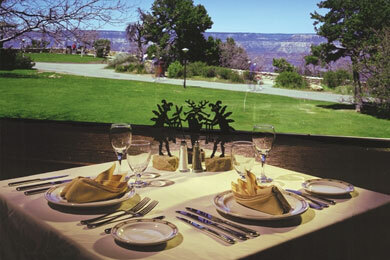 The Canyon room also offers great views of the rim. There is also outdoor seating available on a veranda, which serves drinks and appetizers. The dining room has a separate kids' menu, and staff will provide an activity book and crayons upon request. Advance dinner reservations are recommended for dinner and can be made by calling 928-638-2631, ext. 6432. Dinner reservations can be made six months in advance if you have room reservations and 30 days in advance without room reservations. 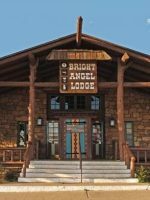 If you prefer to venture out for dinner, try the Arizona Room at the nearby Bright Angel Lodge.